We can shred either on-site (at your location) or off-site (at ours). There is no need to remove staples, paper clips, file folders, or report covers. You save time because AccuShred can destroy it all. 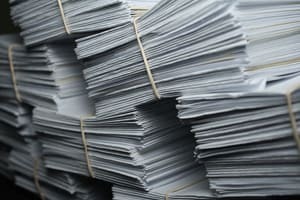 Shredding can also take place directly from your files and bankers boxes. At your request, our locked containers are placed throughout your offices for easy accessibility. Based on your volume patterns, we can monitor and make recommendations to ensure the most efficient and economical use of those containers. No contract is required. Service can usually begin within 72 hours. Although we encourage a routine pickup schedule, we do not require it. Many of our best customers shred regularly and are picked up on an on-call basis. Off-hour service can be arranged for file purges or cleanouts, minimizing disruptions in your workplace. AccuShred is the only area company that currently has the facilities to handle efficiently both the information destruction and recycling needs of our clients.